You’ll love this Gold Coast accommodation at Broadbeach. The Sandpiper Beachfront Apartments offer accommodation that has ocean views that go on forever and the beach is just fifty metres away. Broadbeach is a popular Surfers Paradise alternative; it’s relaxed and has great appeal to families and couples looking for a location with plenty of things to do and see and is an excellent base for your Gold Coast holidays. 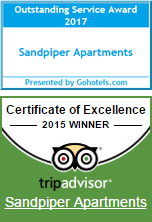 The Sandpiper Beachfront Apartments are fully self contained one and two bedroom abodes. You also have a choice of oceanfront or lower level apartments that have lovely views of the parklands. Directly in front of the Sandpiper Beachfront Apartments is Kurrawa Park, also home to the local Surf Club. Grab a morning coffee, a cold beverage or even a quick and delicious meal on the Kurrawa Surf Club. Adjoining Kurrawa Park is Pratten Park where there are playgrounds, public BBQs and other public amenities. If you’re out with the kids access to conveniences can make or break a moment. If you fancy a swim in the ocean or a day on the beach you dont’t have to go very far. With the beach in front of the apartments, your family can enjoy a safe day at the beach that is minutes from the apartment. Broadbeach has everything for a beachside holiday, or if you happen to be attending or participating in one of the expos at the Gold Coast Conference and Exhibition Centre then the Sandpiper Beachfront Apartments are just a block away. The Sandpiper Beachfront Apartments are the perfect accommodation for the business traveller, so close to all the essential amenities. Your nearest supermarket is just a couple of minutes walk at Woolworths in the Oasis Shopping Centre, with many useful outlets there too. Jupiters Casino is also nearby. Grab a complimentary monorail ride from the Oasis Shopping Centre. If you want a change from the handy Oasis Shopping Centre there’s always the Pacific Fair Shopping Centre. One of the biggest shopping centres in Australasia. You’re bound to find anything you’re looking for there. So there you go, it really does look like you’ve found your Gold Coast accommodation at Broadbeach. The Sandpiper Beachfront Apartments are so close to everything you need for a cracker Gold Coast holiday. Book now.